Tarot Collectors Forum > Main Discussion Area > Decks in Progress > "Les Triomphes"
a long time since I post here, facebook got the best of me. I've been working on a new trumps only handmade deck, like the Triomphes de Paris but much bigger, actually yhe pictures are 9x18cm. The working name for this deck is "Les Triomphes", because that's what it is and I'm already busy 8 hours a day working on the drawings and engraving them. 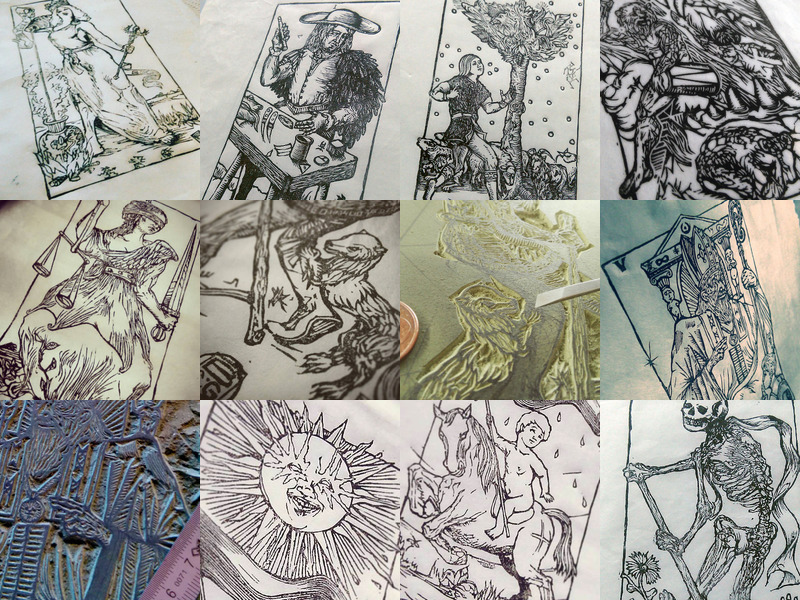 A picture is attached and you'll find (sorry about that) more samples of the evolving work on the facebook page "Tarot maker"
The deck is not yet finished, as it'll demand more than 22 engravings and only six of them are made at the moment (more were made but some were discarded because they didn't meet the standard I'm targetting for this deck). I'm posting here first to let you now about it, but also because I am harvesting emails of people who bought the handmade edition of the Triomphes de Paris (32 copies, so that should be easy if I had been more organized at the time), because to be able to finish this current deck I'll have to rely on pre orders, and, obviously, I will first propose to people who bought the deck. The deck will be more expensive (that will be 23 quite large engravings mounted and finished as cards traditionaly) but there will be a special price for pre orders. The deck engravings will be terminated somewhere in between four months from now and next year, but preorders are currently a necessity to be able to finish the deck. As for my previous deck, and to assure collectors a good investment, the price will be raised with the copies made, so in theory this will be an open serie, but material contingences will naturally limit the number of copies and the price increasing will also be a limit. I forgot the important information : if you bought a Triomphes de Paris or are a member of this forum and are interested in preordering this deck, please send me an email at dutarot@gmail.com with "interest in Triomphes preorder" in the title ! Also if you know other people that this kind of deck might interest please share the information on whatever media you know, although there won't be an unlimited number of preorder possible - something between 10 and 20.
still working, a lot, all ten first preorders are gone but there are five more available. and I'm currently working on a popess, and you can see the work evolving (with other stuffs and some cat pictures but he's a cutie) on my instagram page (no account needed). this apparently didn't meet much interest here just in case someone is interested but didn't react, I'm one card away from completing the engravings, then the cardmaking will begin. It seems most people around here have little to say about much of anything these days.